The Polish driver takes a massive 2"5 win on Nielsen to start the World Championship final from pole. Great start for Basz (Kosmic/Vortex), Hanley (Mad Croc/Tm) and Joyner (Zanardi/Tm) who demoted Nielsen (Tony Kart/Vortex) to 4th at the first corner. Basz bulds a gap, Hanley tries to fend off Nielsen who moved past Joyner on lap 2 with a gutsy move, but the Dane is way too fast for the reigning European Champion. 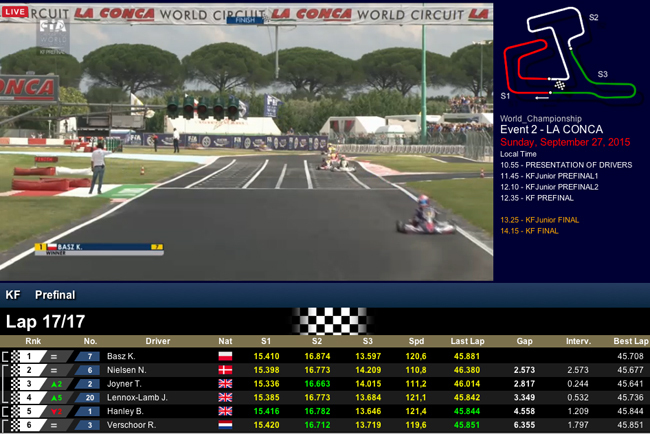 In the meantime, Lennox-Lamb (Birel ART/Parilla) moves up from p9 to p5 shadowing Joyner. By lap 9 Hanley's tyre seem to give in, and he's taken by Nilsen first, and one lap later by Joyner (fastest lap with 45"641) and Lennox in a short sequence. Basz would increase his advantage by the end of the race, and Nielsen will have to start from a not too comfortable 2nd place. Joyner, Lennox and Hanley will surely try moving past him at the first corner. Quiet race for the chasing group led by Verschoor, with van Leeuwen and Hiltbrand all bunched up. Travisanutto and Armstrong rounded off the top-10, as Tiene is forced to retire with two laps to go from 10th.